Papaya, known for its antioxidant and bowel-cleansing properties is now recently in the news for its leaf extract working wonders for increasing the platelet count in patients with dengue fever. Papaya is the fruit of the plant Carica Papaya. It is cultivated in tropical countries such as Bangladesh, Indonesia, India, Philippines, Sri Lanka, and Malaysia. Recently there have been numerous discussions and debates with the media reporting on the efficacy of the leaf extract of this plant for elevating the platelet count of people suffering from dengue. Dengue is a viral disease, characterized by high fever, rash, muscle ache, and joint pain. A severe form of dengue fever, also known as dengue hemorrhagic fever, at times causes severe bleeding, a sudden drop in blood pressure (shock) and death. The dengue virus affects the platelet count and causes platelet count to drop. Platelets are responsible for blood clotting and there are chances of hemorrhage and internal bleeding occurring if the platelet count goes too low. Dengue has emerged as a major international public concern in recent times. Two thirds of the world’s population lives in areas infested by dengue vector which is the Aedes aegypti mosquito. Since there are no antiviral drugs available for the disease, scientists and doctors are investigating various other treatment options. Papaya leaf extract has recently become a subject of clinical studies for its therapeutic properties and scientists are trying to find out about its properties in supporting the rise in platelet count. There are very few studies published till date regarding the potential benefits of papaya for dengue. One study proved that papaya seed was toxic for the vector Aedes aegypti mosquito. In another randomized controlled trial conducted on 228 patients with dengue, half of them were given papaya leaf juice twice a day while the other half received standard dengue treatment. The two groups were then monitored closely and their blood count was checked every 8 hours within a period of 2 days. The group which was given papaya juice showed significant rise in platelet count as compared to the control group. The two genes responsible for platelet production were also studied. Their expression was 13 to 15 times higher in the study group as compared to the control group. This study clearly proves that papaya leaf juice does significantly increase the platelet count in dengue patients. However, these few studies may not present substantive evidence. The biomedical side has also shown mixed reactions. While some advocate use of papaya leaf juice, others do not accept findings from smaller studies and expect more pre-clinical and clinical studies to be done before they can advise its use. Papaya contains two biologically active compounds chymopapain and papain which are useful in the treatment of digestive disorders. Studies have shown that papaya leaf extract has membrane stabilizing properties, thus protecting blood cells from stress-induced destruction. Thus, in this way it may help in preventing platelet lysis in dengue. The property may also be attributed to the flavonoids and phenolic compounds in the papaya leaves. However more studies need to be done to have strong scientific evidence for the use of papaya leaf extract in the treatment of dengue. But that does not mean one should just dismiss the idea of using it in treatment. 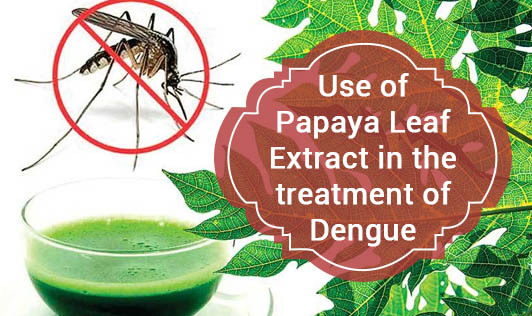 Papaya extract can be used in addition to other standard treatments for dengue even though more large scale studies are required to identify the potent active principle and mechanism to scientifically prove the benefit of papaya leaves in dengue.